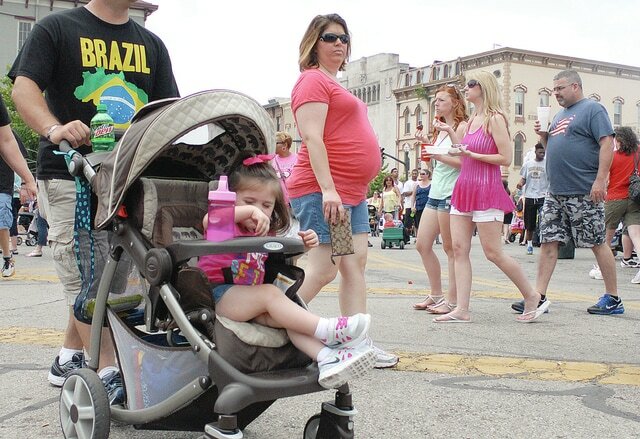 Anthony Weber | Troy Daily News A crowd filled the Public Square, Market Street bridge and levee area during the 2015 Troy Strawberry Festival. TROY — Sunny skies and mild temperatures were the perfect recipe for a sellout weekend. Several clubs and organizations ran out of products on Sunday afternoon — or as early as Saturday evening — before crowds could quench their thirst for all things strawberry. The Future Begins Today booth sold out of its famous strawberry salsa at the festival and had to close shop. Newton Band Boosters sold 17,028 quarts of fresh strawberries on Saturday alone. The organization was completely shut down on Sunday due to running out of its fresh strawberry supply. All in all, it’s a good problem to have for nonprofit organizations’ bottom line, said festival manager Corie Schweser. More than 17,000 dozen strawberry doughnuts were sold from the Troy Music Band Boosters on Saturday. According to festival volunteer Dee Mahan, the Day of Caring booth sold 1,400 strawberry cannolis and were close to selling out of its Sunday supply of 500 strawberry stuffed cannolis early Sunday afternoon. The 2015 Best Strawberry Culinary was awarded to the Troy HS Astra Club with Think Sweet Bakery for their strawberry rhubarb crisp and the 2015 Chairman’s Choice was awarded to the West Milton Auxiliary Fire for their strawberry fudge. Strawberry Festival weekend was a busy but profitable time for all the nonprofit organizations over the weekend. St. Patrick School has been a staple at the festival for 10 years, selling strawberry cheesecake to festival-goers. Kate Lins, a member of the St. Patrick Home and School Association, said the weather has typically played a role in their sales. This year, St. Pat’s sold out of strawberry cheesecakes at approximately 2:45 p.m. Lins said the organization made 300 cheesecakes and had 1,000 pounds of berries. The money from the cheesecake sales goes to enhance the classrooms; enhance the community of the school; provide money to each classroom to each classroom for field trips and excess supplies; provide for students clubs; help any students who need it; and support travel for students who are going to D.C. or Rome. “Basically anything to help the students, faculty or community of the school,” she said. Chad Mullins, owner of Rollin’ Smoke Barbeque in Dayton, was manning the grill to benefit Habitat for Humanity of Miami County. He said the lines on both Saturday and Sunday were long, which obviously was good for Habitat for Humanity. “Our pulled pork sandwiches, sirloin steaks, funnel cakes and strawberry shake-ups sales have been outstanding,” he said. The Troy Softball Parents Association was present for their first year at the festival, selling strawberry swirl cheesecake. Troy Softball Parents Association Vice President Tonia Rohlfs said the organization was brainstorming when they thought about entering the Strawberry Festival as a good avenue to raise money, which turned out to be correct. She said the money raised helped the softball team. Because they can’t charge admission to games, the softball team has limited ways of raising money for uniforms, equipment or to sponsor a trip south during Spring Break. Rohlfs shared the team was grateful to have taken the opportunity to bond.